With two little ones running around, I am always on the hunt for fun ways to keep them entertained. During these cold winter months when outdoor playtime is limited, that means we watch a lot of DVDs! Is there anything better than snuggling up on the couch under a warm blanket in front of a movie with your little ones? I certainly don't think so! So, I always look forward to finding new DVD selections to enjoy with the kids. Something fun and kid friendly...something like My Little Pony- Friendship is Magic: Adventures of the Cutie Mark Crusaders. Every pony is unique! If you lived in Equestria, what would your CUTIE MARK be? The Cutie Mark Crusaders can help you find out! 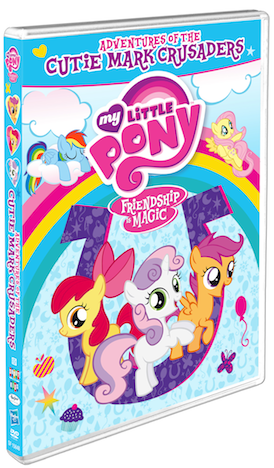 My Little Pony – Friendship Is Magic: Adventures Of The Cutie Mark Crusaders is coming to DVD on February 24, 2015 in the U.S. and Canada from Shout! Factory Kids in collaboration with Hasbro Studios. Offered as a bonus feature is a fun new sing-along and coloring sheets! Sounds pretty great, doesn't it? It's an adorable story with all the fun and excitement they've come to expect and love from My Little Pony and truly offers a great message as well. Sure, we might not have a literal 'Cutie Mark' like the ponies do, but aren't we all always trying to find the things that make us us. The talents or hobbies we possess that make us 100% unique. There are movies and books written about the topic... I love this movie celebrating those differences we all have in such a fun, kid friendly way!! My son- the boy who loves trains and video games and a good fart joke- is actually the biggest Pony fan in this house. (Who says its just for girls!?) He's not a boy of many words, but his response to the DVD was 'awesome'...from him, that's a pretty good compliment. He loved the fun story and characters, and enjoyed the special features as well! If you have a little girl (or boy) in your life that loves all things My Little Pony, this is certainly a must have for their collection! Do you have a My Little Pony fan who would love this DVD? What would their Cutie Mark be? I have a couple of nieces who would thoroughly enjoy this!